Hey everyone, I told you a free-tique opportunity was coming soon and it’s here. It’s finally here! 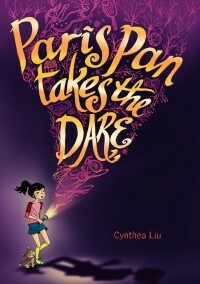 This one should be lots of fun and it’s a chance for YOUR words to get published for the paperback version of PARIS PAN TAKES THE DARE! How cool is that?! Not only am I offering up this coolness, but if your words are chosen by Snoop and me to be forwarded to my publisher for consideration, you automatically win a first-page tique (250 words max) of your FICTION children’s manuscript (PB, ER, CB, MG or YA) for FREE. I think many of you already know what Snoop can do with a one-page tique. If your words are actually selected by my publisher, you win a RESERVED SLOT free-tique (three-chapters (25 pages max) or a full PB). Now here’s why this round is called TAG, You’re it! You can also try things like fragments. One night. One Dare. And a whole lotta fun. <— I don’t know. I kinda stink at this and that is why I am asking for your help. These words will appear on the cover for the paperback version of PARIS PAN. In case you need to know more about the book … here’s a summary! You might also check out the first pages of PARIS PAN on Amazon for possible lines to use from the actual text. Or if you have a copy of the book, by all means, feel free to use anything that’s already in there. OR … make up whatever sounds good to you. We are considering anything and everything. Let’s put those brainstorming caps on! 1) You may send in as many taglines as you want, but only one PER email. Have five taglines? Send five emails. And make sure you put the TAGLINE in the SUBJECT LINE OF YOUR EMAIL. 2) If people send in the same taglines, the first person’s email to hit my inbox with that tagline, claims that tagline. So send in your taglines as soon as they come to you. 3) If more than one of your taglines is selected for forwarding to my publisher, you win a one-page tique (250 words max) for EACH tagline that is selected. So if three of your taglines is selected, you win three one-page tiques. You can combine won tiques as well if needed. 4) I highly recommend zipping a tagline to me as soon as you think of it. Snoop and I will be selecting winners and forwarding taglines to my publisher throughout the day. Get your last taglines to me by 7PM Eastern Time TODAY. Check http://www.writingforchildrenandteens.com for a new post with winning taglines. Also, for more tips on creating taglines for this contest, see http://www.twitter.com/thesnooper. Snoop is posting his thoughts LIVE to help you with the task. 5) Email your tagline as the SUBJECT of your email to this address: tagline AT cynthEaliu DOT com <– please note the E in my name. You can leave the body of the email blank. Snoop and I won’t be reading anything in the body of your message. Only SUBJECT lines. 6) Pass this on to your friends. Everyone has a chance to win something here. Have fun with it! Now TAG! You’re it! Go, go, go!!!! Nice catch! Duh! Thank goodness it’s correct on the printed bookmarks for PARIS. I freaked out for a second there. What a fantastic and welcoming website. I discovered you today and have already learnt some fantastic tips that have helped me to improve the writing I did today! I am beginning my children’s writing journey and am hungry to learn all I can. Thanks again. Thanks for your note! So glad to hear your journey has begun!